It’s been a fairly quiet day for oil markets following some moderate gains yesterday. Crude picked up just shy of 70 cents yesterday, pulled higher by rising fuel prices. After some early morning losses, crude is once again gaining steam. 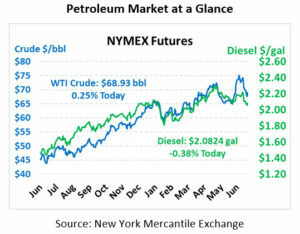 WTI crude prices are currently $68.93, a gain of 17 cents over yesterday’s close. Fuel prices, conversely, are trending lower this morning. Yesterday’s both diesel and gasoline gained roughly 2 cents per gallon, but this morning has eroded those increases slightly. Diesel prices are currently $2.0824, falling 0.8 cents since yesterday. Gasoline is trading at $2.0316, showing steeper losses of 1.3 cents. A reported drone attack in Yemen on a 125 kbpd Saudi Aramco refinery helped to give fuel prices a boost yesterday, though the damage was limited. Attacks in the Middle East often drive prices higher as markets fear the potential for more strikes. Traders will certainly be monitoring the news for any future strikes, though often these events are one-offs that do not escalate. 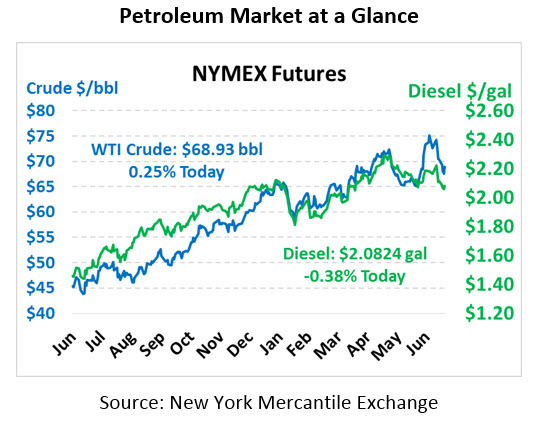 The EIA released their weekly market data yesterday, and markets were surprised by both the crude and gasoline data. Markets had expected crude barrels to show a moderate draw, yet the data revealed a large 5.8 million barrel crude increase. On the flip side, though, gasoline inventories unexpectedly declined by 3.2 million barrels. Refining utilization took a bit of a dip, off 2.4% compared to last week, as refiners cut back output slightly. Along with reduced fuel production came higher demand. Gasoline demand gained over 430 kbpd this week, while diesel demand was up 330 kbpd. The biggest headline coming from the EIA’s inventory report is that U.S. crude production officially hit 11 million barrels per day last week, after trending just shy of the line for the previous month. This new record high level of production helped push inventories higher, assisted by reduced exports last week which kept crude in the U.S.